Whetstone Cutlery Kill Bill Ka.. 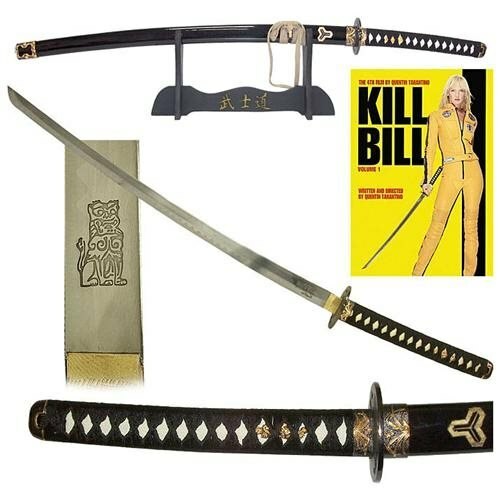 Overall Sword Length: 41.25" Blade Length: 29.25" Handle Length: 12" Blade Material: Stainless Steel Handle Materials: Rubber coated metal wrapped with black thread in traditional katana wrap design Scabbard Material: Hardened Acrylic and Metal Stand Material: Wood Fashioned from the popular movie "Kill Bill" and "Kill Bill Vol. 2" this fine reproduction katana is the most intricately designed swords for the best price you will find. This is the "Bride's" sword. Stainless steel blades are etched to appear to have the deadly sharpness of a real samurai sword, although this blade is not sharpened for safety reasons. The Bride's blade features an additional engraving near the handle. The blade has a full, two-handed 12" handle beautifully wrapped in thread as with most traditional katana handle wraps. As an added detail, the ends of each handleare topped with gold-painted metal designs. This swordis beautiful! Traditional and authentic long wrap technique featured on scabbard. And two-tone intricate gold-painted metal trimmings throughout the sword make this a gorgeous addition to any sword collection.A matte black painted wood display stand also accompany this sword set. Ancient japanese lettering is painted in gold on the stand as well, adding to the authentic look of this sword.